York Exercise Bikes Review (2019): How Good Are These Magnetic Bikes? 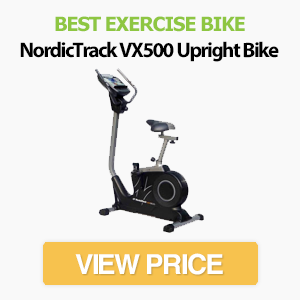 Thinking of buying a York exercise bike? Or just want to learn more about this popular brand? In this article, we discuss the company's best bikes and compare them to those from other brands. York fitness bikes are a popular choice for people who want the convenience of a home gym without spending a fortune. With budget prices and a range of features, the brand has quickly grown to dominate the low-end exercise bike market. Are York Exercise Bikes Any Good? Which is the Best York Bike? York Fitness is a UK company that manufactures a range of fitness equipment. While they are probably best known for their home exercise bikes, York also builds cross trainers, treadmills, weight training equipment and various accessories. Most of York's home equipment is aimed at the​ budget or mid-range markets. York bikes aren't the cheapest, but they are often much less expensive than premium brands - although they also sell a few pricier models. For comparison, York's cheaper options compete directly with Roger Black bikes (which you can view here). More importantly, the company has a reputation for producing excellent budget bikes that provide great value for money. Let's take a look at some of their most popular models. If you buy one of York's cheaper uprights, don't expect it to match models costing three times more. And if you need a bike for high-intensity workouts, a low-priced upright from any brand isn't going to be up to the job. ​When it comes to value for money, however, York are amongst the best on the market. Which is the Best York Stationary Bike? Listed below are four of the best York exercise bikes currently on the market. York has a habit of changing their range on a regular basis, but the list is up-to-date at the time of writing. We also update this page to keep it in line with the company's current range. If you're looking for a budget upright exercise bike that can still provide a challenge, the York Active 110 is one of the best on the market. It lacks the advanced features of more expensive models, but is robust, smooth and simple to use. What makes this bike such a popular low-budget option though? 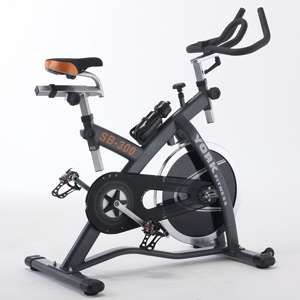 The Active 110 is a magnetic exercise bike. This makes it smooth and quiet compared to friction-based models, and you can quickly select from eight resistance levels using the on-board console. Speaking of the console, the 5.75" LCD screen shows metrics such as heart rate, speed and distance. There are also four programmes, including a manual option and Fitness Test. Sadly, there's no smart connectivity or iFit compatibility, but you wouldn't expect this from a budget machine. An advantage of the York Active 110 compared to similarly priced alternatives is that the seat height, seat reach and handlebars can all be adjusted. This makes it easier to adapt the bike to your height and body shape. It's important to have realistic expectations though. The 4kg flywheel, while suitable for light workouts, isn't heavy enough for serious training. The bike is also frustrating to assemble, so be patient and follow the instruction manual carefully. It's hard to beat the York Active 110 in this price range though. If you need an upright bike for light or moderate intensity workouts, it's one of our top picks from any brand. If the Active 110 can't meet your exercise needs, the Perform 210 is a robust stationary bike for more intense workouts. It costs more, but has a much higher maximum resistance and a wide range of workout programmes. A key difference between the Perform 210 and the 110 is the 7kg flywheel weight. While this is far from the heaviest flywheel on the market, it's better suited to moderate intensity workouts. The magnetic resistance system also means it's quiet and smooth in operation. The 210 also has 32 magnetic resistance levels to choose from, giving you much greater control of your workouts - and a considerably higher maximum difficulty. Instead of just four workout programmes, there are 19 included with the 210, with four heart-rate control options. Like the 110, the 210 has an adjustable seat (reach and height) and adjustable handlebars. There's also a three-colour LCD screen showing stats like time, calories and distance. Keen athletes will be glad to hear that York has included a power output (Watts) metric with the 210 too, which is often missing from cheaper bikes. Other features include heavy-duty pedals, a drinks holder, and a maximum user weight of 150kg. There are also wheels to make it more mobile. 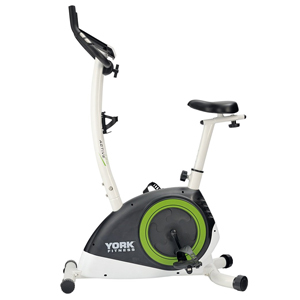 The biggest drawback of the York Perform 210 is that it's one of the most expensive York exercise bikes. If you're on a tight budget, the 110 or 120 may be better options. It's also probably not suitable for the highest intensity workouts - for that you'll need a spin bike (we reviewed our top models here) or a more expensive upright. As with many exercise bikes, the seat is uncomfortable - and that's putting it kindly! You'll probably want to replace it with a softer gel-based ​cover if you're going to use it regularly. It also lacks a phone/tablet holder. Even so, the Perform 210 is a decent all-rounder that's a significant step-up from the Active 110. Indoor cycles - often known as spin bikes - are better for high-intensity workouts than uprights. The best options are solid at high speeds and make it easy to climb out of the saddle. While York are known for their uprights, the company produces several indoor training bikes. The SB300 is our top pick in this category, as it's a durable model that provides great value. Like most spin bikes, the SB300 has a heavy 18kg flywheel. This is one of the reasons why spinner workouts are more intense. There's also an adjustable seat, direct chain drive system and front wheels for transportation. Unlike the other models on this list, the SB300 uses frictional resistance. This is common for spin bikes, as it allows for greater difficulty than magnetic, but means the machine is louder. A downside to frictional resistance is that there's no way to measure your output power. Note: The SB300 is an older model that can be difficult to find. You may need to contact York directly to buy it. The York Active 120 is the bigger cousin of the 110. It's a bit more expensive, but is upgraded in several areas to provide a more challenging workout. What's the difference between then 110 and 120 though? Firstly, the 120 has 16 levels of resistance instead of just 8. This gives you more control of your workout and allows for higher intensities. There are also 12 pre-set workout programmes. These are great for beginners or intermediates, but the 120 still isn't designed for high-intensity workouts. Unfortunately, it's hard to recommend this bike. 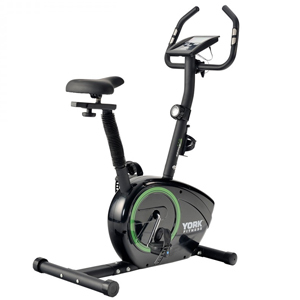 Unlike other York exercise bikes, which often hit the sweet spot between price and performance/features, the Active 120 is neither a cheap bike for beginners, nor suitable for high-intensity workouts. For this reason, we recommend choosing one of the other options on this list. Note: The Active 120 is difficult to find for sale. That's why we recommend the Perform 210, as it's the better all-round model and is available from several stores. York Aspire Magnetic. The Aspire was an upright with a large LED display. It's no longer in production. York Quest. The Quest was an older model that's also no longer for sale. It had similar features to the entry-level range. York C202 Cycle. This bike was a budget model with 16 magnetic resistance levels and a colour display. It was a popular machine, but appears to have been replaced by the Perform 210. There was also a cheaper C201, which has also been discontinued. York exercise bikes might not be the most advanced on the market, but the best models provide excellent value and a great workout. 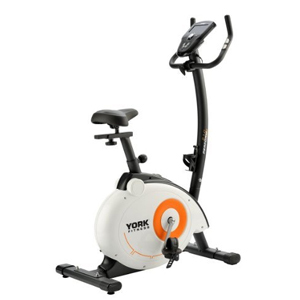 If you want a solid exercise bike without spending a fortune, York are certainly a brand to consider. Do you have any questions about York Fitness exercise bikes? Or do you own a bike from this brand and want to give feedback? Please use the comments form below.